Added on July 17, 2013 by Ken Maldonado. 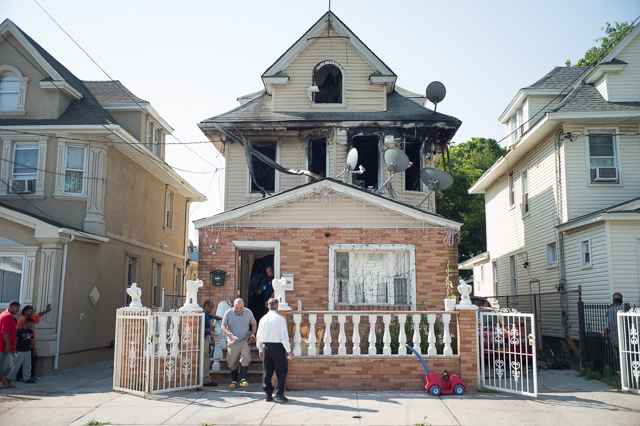 A home located at 138-16 102nd Avenue in Jamaica, Queens was the scene of an early morning fire that killed 50-year-old Josephine Humphrey. Firefighters discovered her body with severe burns as they were attempting to put out the second floor fire shortly before 6 a.m. Unrelated residents in the multiple family home escaped without injury. Mayoral candidate and former city comptroller Bill Thompson speaks with small business owner Tamanna Yasmin after a press conference in East Elmhurst where he pledged to protect small businesses from unnecessary and excessive fines citing examples such as a $60,000 fine for a grand opening sign and a health code violation issued to a restaurant where an unused and therefore unplugged refrigerator was above required temperture.